Stroll through the mall on a weekend and you get the impression teens save money to buy clothes or iPods and video game systems, but a new survey shows their priority is quite different _ saving for college. The survey by online brokerage TD Ameritrade Holding Corp. shows putting money away for higher education is the top savings goal for today's teens. 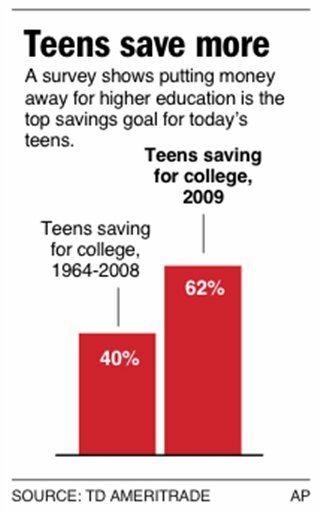 The results showed 62 percent of teens aged 14 through 19 save their money for college, a much higher rate than the 40 percent of adults who said they saved when they were teens. The results weren't expected by educators who are pushing for financial literacy education in schools. "It's a pleasant surprise that we're seeing young people paying that much attention to the importance of this issue," said Joseph Peri, CEO of the nonprofit Council for Economic Education. "Part of teaching the importance of investing is showing that the best investment a young person can make is an investment in themselves." Peri's group and several other educational organizations are holding a conference in Washington this weekend in which 500 educators and government officials are discussing ways to teach basic financial literacy in schools. That means educating students about budgeting, bank accounts, investing and saving. Although the T.D. Ameritrade survey indicated teens understand some of those concepts, it revealed some interesting generational shifts in attitudes about money. Fewer than half of today's teens said they get their cash from part-time or weekend jobs, while 77 percent of adults said work was their source of money as teens. Today's teens get most of their money from their parents or from gifts for occasions like birthdays. The fact that they are given more of their money rather than earning it increases the importance of financial literacy at a young age, said Diane Young, director of retirement and goal planning for TD Ameritrade. "One concern would be that when the focus is on saving for such a long-term goal and their parents are taking care of their day-to-day expenses, are they really learning how to manage cash flow?" she said. Today's teens are more likely to get money for credit card payments, clothing and a car from mom and dad. Back in the day when today's adults were teens, they were much more responsible for their own bills and transportation. For example, just 9 percent of teens said they pay for all the costs associated with a car or other transportation, while 36 percent of adults said they had to pay for those expenses at that age. The survey shows teens are not hesitant to sock more of their money away than their elders did when they were young. About 87 percent of teens say they save. That compares with 56 percent of adults who said they saved some portion of their income as teens. The results also show 78 percent of teens said they want to establish a plan with their parents that involves splitting the cost of education. That interest should prompt teens and their parents to discuss the options for saving. They can include a prepaid tuition plan that locks in costs of tuition and mandatory fees. There's also a 529 savings plan option that's an investment account offering tax-free earnings growth to cover tuition and other costs such as room and board and books. Other options include a Coverdell education savings account, which is similar to a Roth IRA in which taxes are paid up front but the savings grows tax-free and are taken out with no taxes due. Custodial savings accounts, those set up by parents and turned over to students when they become adults, are also available. They typically help families set aside money for expenses not covered in the other plans such as sorority dues or music lessons. The willingness of teens to share the financial burden shows that they are very aware of rising college costs, Young said. More than 80 percent of teens eported that they consider education to be essential to future success, compared with 56 percent of adults surveyed who say they felt that way as teens. "We've become more conscious of the opportunities that are out there for us and the competition that's out there," said Megan Partridge, 17, a student at Voorhees High School in Glen Gardner, N.J.
She said the importance of getting a college education has many teens and their parents thinking about how they're going to pay. Partridge said although she doesn't set aside her own money, her parents have started saving for her college. Outside of school, she's working on gaining experience that will help her succeed in college. For example, this summer she attended a youth leadership program in New York hosted by SuperFutures.org, a career development organization founded by financial services entrepreneur and author Jennifer Openshaw. Partridge said she met experts in sustainable development, an area she hopes to study in college. The TD Ameritrade random telephone survey was conducted by Opinion Research Corp. for TD Ameritrade. The company interviewed 768 adults and 365 teenagers Aug. 6-10. The statistical margin of error for adults is plus or minus 3 percentage points and for teenagers 5 percentage points either way. The survey points to other interesting trends about how kids learn about money. It's no surprise that 93 percent say they rely on their parents for guidance about managing money, with half going to mom for most of the answers about money and a third saying dad is the most help.